When it comes to what people think about your company, it doesn’t have to be happenstance, guesswork, or luck of the draw. You can actually plan your presentation—from the moment your visitor enters your office workspace to the moment they leave. Although you can’t control what others think, a planned presentation can work to your advantage in directing mental traffic. 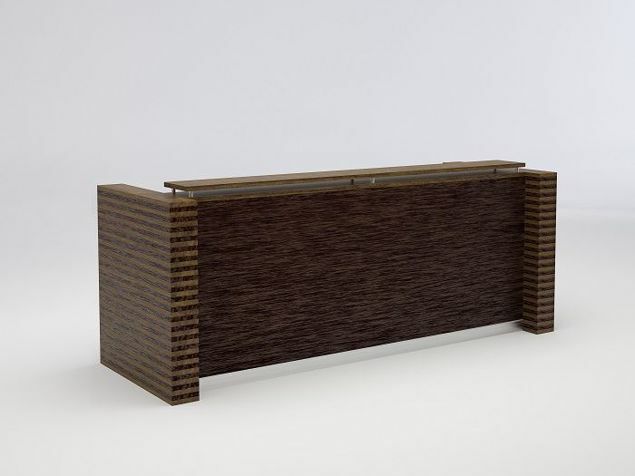 The Colorado Modern Reception Desk can be your first step in planting the mental seed that your company is not just an average one, following the common path. 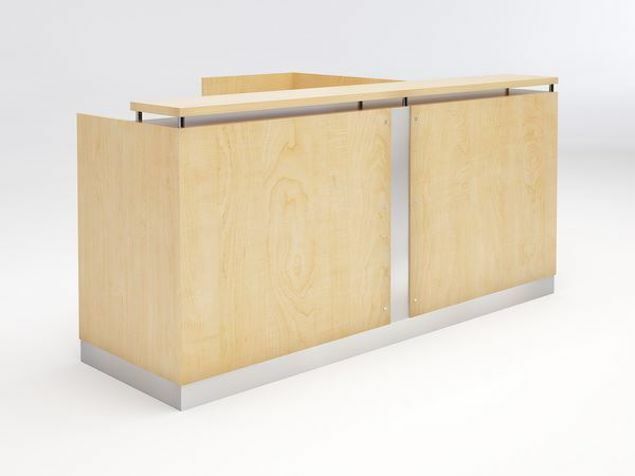 The Colorado Modern Reception Desk was planned to make a striking presentation. 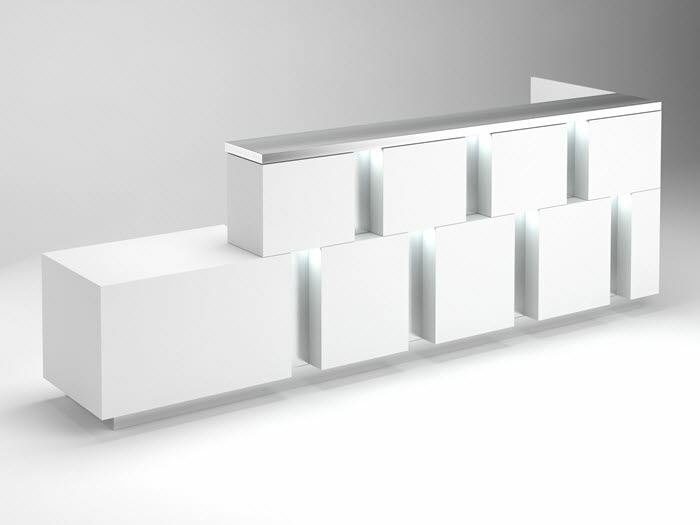 The three-dimensional structure stands out from the crowd of average entryway reception desks. Although the lines are pretty straightforward and maintain a modern geometric profile, there is something about the Colorado that communicates simplicity—but with flair. We feel the raised panels give off a visual appeal that can be subtle or more dynamic, according to your choice of color background. Raise or lower the visual intensity simply by contrast. Our entry-level design allows you to select from an array of HPL color combinations. The desk configuration can be yours by request. Configure with a single-height (42"H) platform for user privacy, or drop down to a desk-height combination for a more communicative visitor/worker environment. Increase visual acuity by adding recessed lighting (optional). 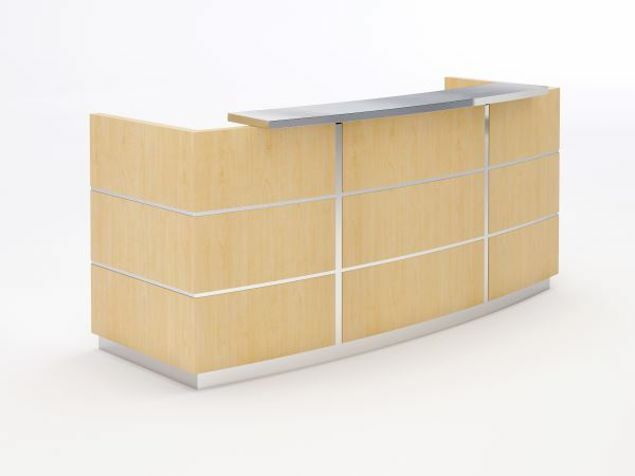 The Colorado Modern Reception Desk is available in sizes as small as 52"W x 30"D x 42"H, and can be as wide as your needs dictate. 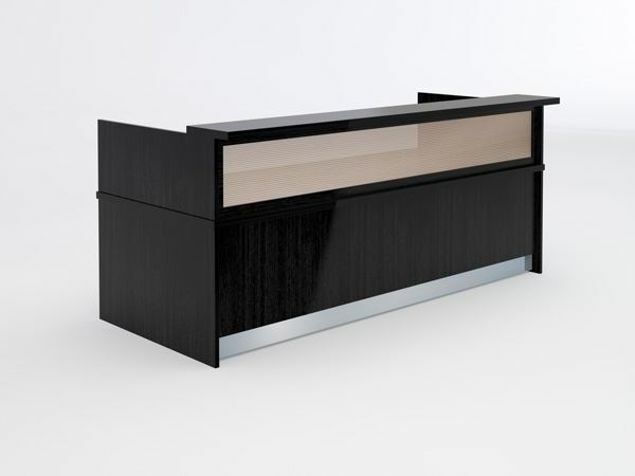 The transaction top is designed at 8"D, and can run the width of the desk. The desk base rises 5" from the floor, and is set back from the face. The work surface measures 24"D and runs 50.5"W.
The Colorado design concept shown here offers a white specialty laminate with a brushed aluminum back face. The Colorado shows at 132"W with a brushed-aluminum transaction top. LED lights are recessed into the underside of each facial square. Priced at $5,440. Our image doesn’t match your image? Check out what our clients are saying about us. Click here! All of our products are available in any size and a variety of colors and materials. Call 1-855-699-0334 for more information. Some minor assembly required - Learn more.